Scott Shane’s New York Times story Friday, linked President Obama to President Jimmy Carter. Shane maintains that Obama, like Carter before him, could also be a one-term president. The New York Times must have gone into a panic mode for its editors to set Shane loose on such a comparison. There is a good reason for that panic. Polls show that, especially in crucial swing states, President Obama’s lead is increasing over his challenger, Mitt Romney. Even Benjamin Netanyahu (above, during his UN speech) has thrown in the towel, promising to hold off his attack on Iran until after the election. The Times hit the panic button not because it wants Romney to win. What frightens the Times is the same realization that hits sports editors when a football team loses both its star quarterback and leading receiver just before the Super Bowl. A month is a long time to cover a political fight when the outcome is already determined. What to do? What is a profit-oriented publication giant to do with all those political news pages to fill? So it is that the Times looks for ways to instruct candidates Barack Obama and Mitt Romney, “let’s you and him fight”. That old saying just happens to be the title of a great old movie cartoon starring Popeye (shown at left) during which Popeye’s faithful girl friend, Olive Oyl, knowing Popeye is doomed to lose, reaches for Popeye’s main source of energy, a can of spinach. What can the Times do to generate a fight in the political ring even though every political signal says, it’s over? Simple, just bring on the spinach. Ignoring the polls that show the race virtually over, the Times sends Scott Shane to ringside, with his can of spinach, which is a story that links Obama to Carter as a one-term president. Never mind that the linkage is spurious and unfaithful to history. No one believes that spinach has that much energy-producing power, either. It is the story that matters. The Times can tolerate a spurious comparison, so long as it brings life back into the fight. Scott Shane, begins his spinach story with the always useful, alarming phrase, he tells us a president is “struggling”. Hey, everybody, listen up, the game is still on. A president struggling simultaneously to cope with anti-American tumult in the Middle East and fix stubborn economic trouble at home: Is President Obama replaying the one-term presidency of Jimmy Carter? So Mitt Romney and Paul D. Ryan have repeatedly suggested, trying to use the glum precedent of the Carter presidency to taint Mr. Obama’s record and produce the same electoral result 32 years later. Shane cites unnamed “historians” who claim that “broad parallels between Mr. Carter’s term and Mr. Obama’s make for legitimate comparisons”. Hey, I was an “operative” in that 1980 Jimmy Carter campaign, a small operative, to be sure. Shane’s unnamed “historians” would insist I admit that major decisions in the campaign were not made at the Illinois state level, where I was Carter’s campaign manager. But I did know Jimmy Carter well. I knew then he was not, and is not now, “dour, inward-looking, suspicious by nature”. For the record, having known my fellow Georgian since 1974, I will testify that Carter was then, and is now, warm, out-going, and properly suspicious, by nature, of journalists and politicians who try to impose their own narratives on him. Shane defends the Romney-Ryan case by using flimsy evidence which any Carter “operative” from the 1980 campaign, could have quickly refuted. Shane is repeating political tropes that have calcified into gospel truths, such as “in over his head”. What president is not “in over his head”. They all are. The job is too large and the chaos too overwhelming in any era, for any single individual to claim otherwise. All each president can do it cope with the task at hand, a task that always includes having to deal with politicians ready to deal with anyone who will help them win a political fight. To his credit, Shane brings in an historian who is willing to be quoted, to make the case that Jimmy Carter was capable of dealing firmly with an enemy who was holding American citizens as hostages in Teheran, Iran. David Patrick Houghton, a political scientist at the University of Central Florida and author of a book on the Iran hostage crisis, said the Carter comparisons were “mostly unfair” — both to Mr. Carter and Mr. Obama. He singled out as “utterly false” Mr. Romney’s claim that Mr. Reagan’s tough reputation caused Iran to release the American hostages just as he became president; in fact, the Carter administration had negotiated their release. “This campaign has become a kind of opportunity to fling around bogus history,” he said. Romney’s claim is, indeed, “utterly false”, when he claims, “Reagan’s tough reputation caused Iran to release the American hostage just as he became president”. The release of the hostages on Reagan’s inauguration morning is also believed to have been part of a deal arranged by Reagan operatives to reach an agreement with the Iranian government that it would hold the hostages until after the election. For more on this deal, see Gary Sick’s detailed account of the events surrounding the delay of the release of the hostages in 1981, in his book, October Surprise. As Historian Houghton noted, the Iranians had earlier agreed with Carter, after lengthy negotiations, that they would release the hostages. All that was left was a decision on the timing of the release. A pending timing decision was too tempting to duplicitous politicians not to negotiate their own side deal. Together the Iranians and the Reagan operatives agreed on a “deal” which led to a delay in the release of the hostages until after the election. Many analysts agree that particular deal with the enemy ended any chance Carter had of winning the election. Carter had lost his fight to free the hostages, who had been held for almost 444 days of his presidency. Fighting to gain the upper hand in a political battle emerged in the speech Israeli Prime Minister Benjamin Netanyahu gave to the United Nations General Assembly earlier in the week. Before he scaled back his threat to attack Iran before the November 6 election, Netanyahu made one final gesture of defiance against Barack Obama. Unfortunately for him, his defiance included a decision to unwittingly emulate a movie comedy figure, Wile E. C0yote (shown here) by drawing a cartoon bomb to illustrate to the United Nations General Assembly what Netanyahu believed was line showing how close Iran was to having the capacity to produce a workable nuclear bomb. 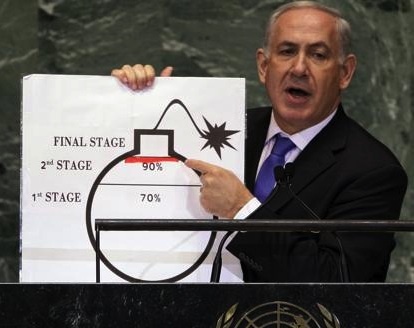 Commentators like Richard Silverstein, have shown just how much Netanyahu, with his comic bomb drawing, (at top), looked like Wile E. Coyote (shown here.) in the 1952 movie cartoon short, Operation: Rabbit. Prime Minister Netanyahu’s final gesture of defiance may or may not, fare better in history than did Wile E.Coyote in his battle with Bugs Bunny. Politicians are unpredictable, and those that possess a nuclear arsenal, as Netanyahu does, are especially dangerous when they feel trapped. Meanwhile, there are three presidential debates, and one vice-presidential debate, before the election on November 6. I await with great anticipation, just how the New York Times will cover the first debate Wednesday, October 3. Maybe they will have a fight story that depicts Wile E. Romney getting up from the canvas to score a decisive victory over the champ, Bugs Obama. The picture at top of Prime Minister Benjamin Netanyahu is from the Boston Globe. It was taken by Richard Drew, of the Associated Press. This entry was posted in -Movies and politics, Media, Middle East, Middle East Politics, Movies, Netanyahu, Obama, Romney. Bookmark the permalink. You are right, Jim. The New York Times was trying to manufacture “news” that made no sense, except to sell more newspapers. The irony regarding Reagan-Iran is that, having agreed to deal with an enemy behind the back of the President, was nothing less than treasonous. One day, there should be an investigation that extracts the details from Iranian sources, after our relations are normalized.. The other point is that Iran chose to help Reagan get elected because they found Carter to be much more determined and stubborn in his attempt to release the hostages, and it is his strategy that won their release, after all. The Iranian side probably wanted a face-saving gesture to accomodate a new US President. It is interesting that Reagan did not go bombing Iran after the saga of the hostages, as he did Libya later on. On the contrary, Reagan later repaid Iran’s new rulers, by giving Israel a green light to ship Iran vitally needed spare parts for its US-supplied airforce and tanks. It is rumored that Israel has a German-made submarine armed with nuclear missiles that is positioned in the Persian Gulf. I would still not put it past Netanyahu to launch his strike against Iran before the elections, inspite of his UN presentation and what it “implied”. If he does, it will not only take Iran, but also the entire world by surprise. But, it shouldn’t. Never underestimate Netanyahu’s and Israel’s arsenal of deception.